Bad news: son and daughter-in-law live far enough away that we get down to see them just once or twice a year. Good news: that's enough time that invariably a new restaurant has moved into town by the time we get there, and of course we all have to go. In June, it was the table. Last month, it was Orchard City Kitchen. oh yeah. OCK is geared around one of our favorite ways to dine - the small plate - known in our little world as 'shared plates.' 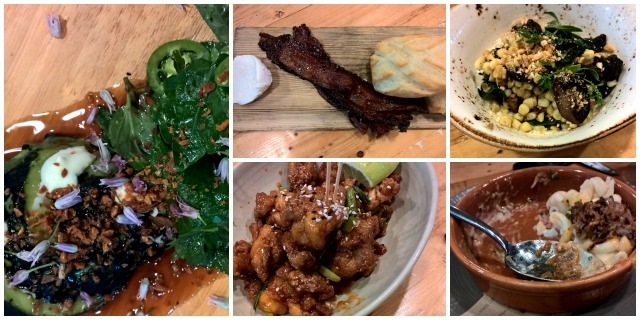 That way, we can try even more dishes than if we each ordered our own meal....Triple B (biscuits, bacon, & honey butter), white corn with criminis, kale, & herbed goat cheese (oh! and "corn dust" or ground corn nuts), macaroni & cheese with brisket & Seattle's Beecher's flagship cheddar, Korean fried chicken, and charred avocado with ponzu sauce, serranos, and herbs. Ok, we'd never had any of that before! As good as the food was, it couldn't beat the precious camaraderie around the table. What fun to peruse the menu together, catch up while waiting for the next dish, discover new tastes, evaluate and choose our favorites. Pretty much the best kind of meal. ok, now I'm starving! it all looks fabulous! You all ALWAYS find the best restaurants! Yum. Great choices. I just wanted to add that the Mac n Cheese was SO GOOD, we ate most of it before we remembered to take a photo of it! Indeed, this was the best kind of meal, for reasons extending way beyond the food! Wow! Thanks for the review We will have to try it. We live in Willow Glen so it's just around the corner for us.